Home » Apply for an account! Managing a fuel program can be an overwhelming and costly responsibility. That is why Clean N’ Green/PetroCard strives to provide powerful fueling solutions to give you control. We try our best to help improve your cash flow, reduce transportation related expenses, and effectively manage your time. Clean N‘ Green: If you are a local company with a close radius around one of our Clean N’ Green stations, we have a card option that’s perfect for you. 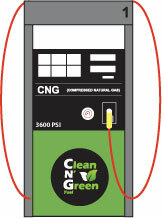 Our Clean N’ Green card will help you manage your compressed natural gas purchases. Our stations are open 24/7/365*, well-lit and have security cameras to prevent theft. Wright Express: While our Clean N’ Green stations are rapidly opening throughout the U.S., we still might not have a location near you however you still might need a solution to manage your fuel purchase. Most of our competitor compressed natural gas stations accept the Wright Express card as well as 90% of all retail facilities in the U.S. if you have still have diesel or gasoline vehicles. Online Account Access: Our Online Account Access provides secure access to your fueling information 24 hours a day, 7 days a week. With detailed reporting and online account maintenance, Online Account Access gives you the tools to track fuel purchases and manage your account on a consolidated invoice for all your fueling transactions.